Misleadingly titled "Home and Away: The Movie", this UK release is actually the feature length pilot episode of the show. 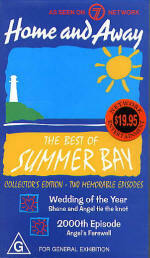 It follows the Fletcher Family moving to Summer Bay after Tom loses his job in the city. After having trouble with Bobby Simpson, she eventually becomes their sixth foster child. The episode has an extended version of the closing theme tune. This video is often available from Ebay (UK). This UK release from 1993 contains five full episodes with complete opening and closing titles. 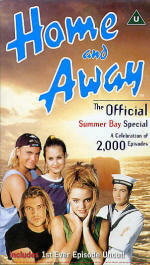 Another UK video release from 1996, containing the special programme made to celebrate 2000 episodes of Home and Away, presented by Emma Lee. There are many clips of classic moments from the show, and it ends with the complete first episode (the 30-minute "Episode 1" which follows the feature length pilot) in which the foster kids begin trying to promote the Caravan Park. Home and Away stars on holiday. Starring Nic Testoni, Belinda Emmett, Kristy Wright and Ben Unwin. Directed by Nic Testoni and soundtrack by Belinda Emmett. Distributed in the UK by Quantum Leap. 57 minutes approx. This Australian release from 1996 contains two full episodes - Shane and Angel's wedding, and the 2000th episode. With full opening and closing titles, plus commercial break bumpers, this video was a treat for UK fans at a time when ITV was cutting the closing titles down to three or four seconds. This video is often available from Ebay (Australia). 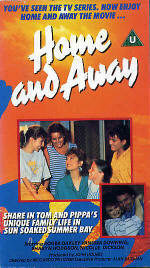 A number of Home and Away Videos have been produced over the years, containing a range of landmark episodes.